I absolutely love my life in Costa Rica. Living in the lush and verdant Orosi Valley, I have found my perfect retirement paradise. But every silver lining has a cloud here and there, and there are definitely some aspects of my personal paradise that can be trying from time to time. So what are those things that sometimes cause me a bit of consternation? “Pura vida” is the unofficial national slogan of Costa Rica. It is used to signal everything from “I’m great” to “whatever”. It is more a philosophy than a phrase to be translated. But this laidback credo, that is initially so alluring, can create frustration for those of us who are more accustomed to a more regimented way of living. When you harken back to your high school Spanish class you’ll remember that ahora means “now” and mañana means “tomorrow”—until they run smack into pura vida. In Costa Rica, ahora is used for “later.” And mañana indicates sometime in the future, but probably not tomorrow. But adapting to this change can make your life all the better. Slowing down, enjoying life as it comes, and removing pressured expectations makes for a leisurely outlook that’s low on stress. Costa Rica continues to rank as one of the happiest and healthiest place on the planet; there’s no doubt in my mind that it’s a result of the pura vida ideology. In my part of the Orosi Valley, we live right up against primary forests. 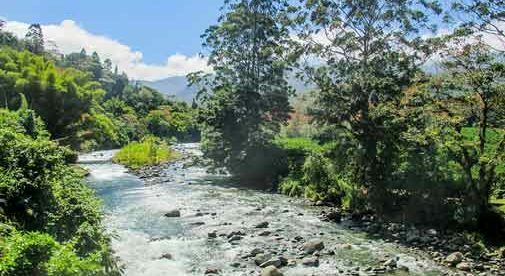 The Tapanti National Reserve, 12,500 acres of preserved wilderness—jungles and rainforests—collects more rain than anywhere else in Costa Rica. Over 150 rivers of various sizes start here as they head toward the Caribbean. There are over 45 species of mammals and over 260 types of birds. You don’t need to go looking for these animals either, because they will come to you. You may think that sounds great, until you realize that means all the local creepy crawlers are likely to pay you a visit too. And what can you do to stop it? Not much. An outdoor tropical lifestyle means you share your life with theirs. But this is just a minor upset outweighed by a greater good. Costa Rica’s natural beauty is breathtaking, and no camera can capture the true splendor of the real thing. You really have to be up close and personal to really appreciate it. When you realize that, you won’t be bothered by a few ants when you can see toucans and monkeys in the trees outside your window. During the last rainy season, we had 154 inches of rain at my house, with a lion’s share of that falling from the end of September through the beginning of December. How bad can a little rain be? With the sudden torrents, come some mud slides—resulting in road closures and the occasional power outage. This is when the pura vida mindset can be at its most trying—when you hope that these problems will be fixed ahora, but you know it’s more likely going to be mañana. But these rains are a vital part of what makes this place so special. In the Orosi Valley, we never face the withered, parched desiccation that much of the country faces December through May. We stay lush and green year-round due to the rain. And even during the rainy season, there’s nothing better than sitting inside with a great cup of afternoon coffee, watching and listening to the downpour outside. Surfing, white-water rafting, deep-sea fishing, canopy zip lines, rock climbing, and adventure hiking in the rainforest or on top of a volcano—Costa Rica has it all. As a result, tourism earns more in foreign exchange than bananas, pineapples, and coffee exports combined. There’s a ton for you to see and do—you and everyone else. The problem here is that it can get crowded at the most popular sites. As a result, the peaceful hike through the rainforest that you desired can actually turn out to be an uncomfortable struggle to get through a frenzy of camera-laden tourists blocking your path. But this can be avoided when you live here. Due to its central location, the Orosi Valley offers swift access to all parts of the country. This means that there’s no need to visit the popular areas during the height of tourist season, so dealing with crowds is never a problem. And there are countless hidden spots that only locals know about for those times that your favorite destinations are crowded with out-of-towners. Back in 1997, my wife and I were married in the sunny glass-covered atrium of the Don Carlos Hotel in San José, Costa Rica. The hotel provided a musician who played keyboards and a notary public who handled the paperwork and shared with us the bottle of champagne the hotel included in the wedding package.